In every home we have ever lived we have never used our garage as well, a garage... We have always utilized it as an additional living space and place to hang out. Our newest home features a 500 square foot garage that we have been using as storage while we were unpacking and settling in. Well, fast forward 2 years and we are still not 100% unpacked and our garage has turned into a cluttered mess... So we decided enough is enough! 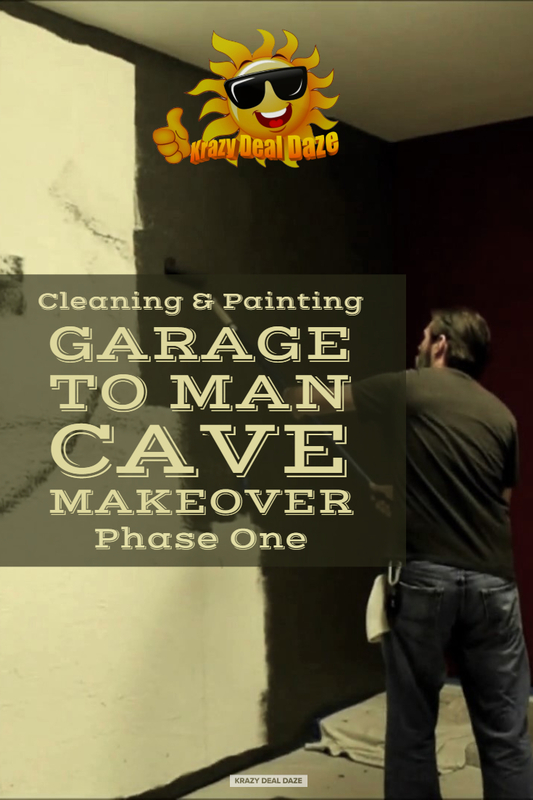 It's time to remodel the garage. So first things first we have to get everything out of the garage so we can start cleaning and prepping the walls for new paint. To accomplish this we needed to rent a storage unit. Because of what we needed to store and how much we needed to store, we had to spend the extra money on a large climate controlled storage unit. Thankfully there were three of us in the family that was in need of a storage unit so we combined our stuff and split the cost three ways. Once we got everything in storage, it was time to start prepping the walls to be painted. To do this we first removed all the outlet covers and switch plates. Then filled and patched all the holes that were in the walls. We used Silka Pro Select Stucco Patch and ProForm All Purpose Joint Compound and a putty knife to accomplish this. 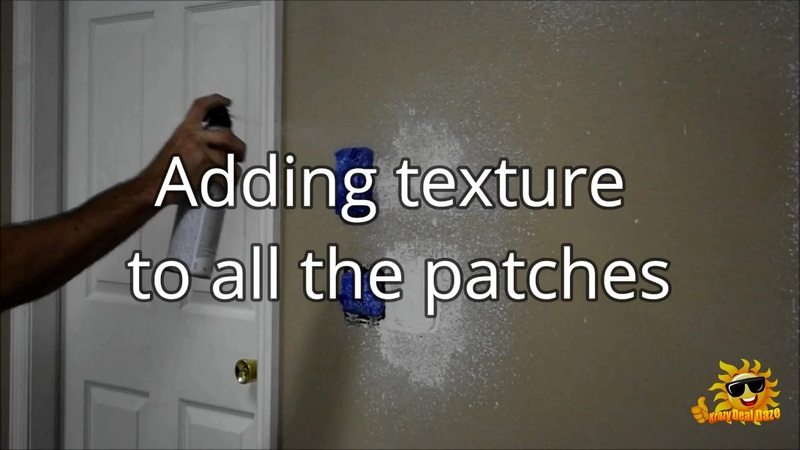 Dry time for the Stucco patches took at least 1-hour minimum for a partial cure, depending on temperature, humidity, and depth of repair. Full cure can be achieved in 72 hours. 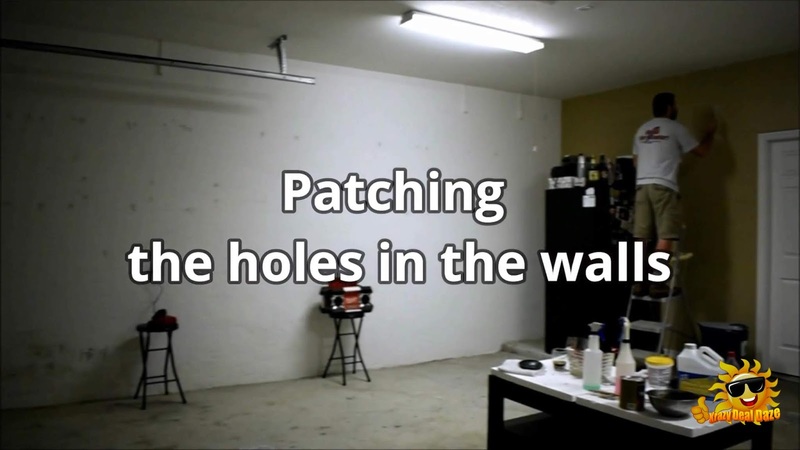 The Drywall patches took 24hrs to fully cure. Note that wet or damp conditions will slow the drying process. Subsequently, 24 hours dry time may not be sufficient. We also used Dap painters acrylic caulk to seal up a few things before painting. According to instructions, you should allow the caulk to dry 2 hours, longer in cool/humid conditions before painting. While waiting for our patches and caulking to dry we moved on to the next item to be done before we started painting. 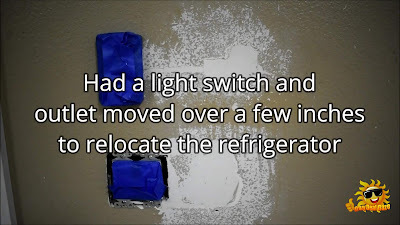 We have an extra refrigerator that we use in our garage and where we wanted to move it to would have blocked the light switches and garage door opener. So we had an electrician move them over a few inches to accommodate where we wanted to relocate the refrigerator. Then we went over all the wall patches with Wall Texture by Homax in Orange peel, to match the texture of the rest of the walls. Once painted the patches should blend right in. First, we took the masking tape and taped off along areas we did not want to be painted whatever color we were using at the time. After taping off the baseboards and door trim we also hung plastic over the door. Although we are going to apply a new finish to the floors we still laid down a drop cloth to avoid having to potentially clean up a big mess in the event of an oops! 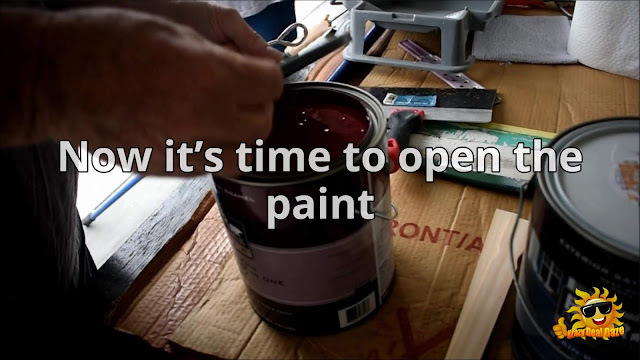 Now it's time to open the paint, this is where a paint key comes in handy, you can also use a screwdriver if you don't have a paint key. Although we had our paint premixed when we bought it, we still mixed our paint using a stir stick. We also punched drainage holes into the rim of the paint can with a screwdriver and hammer. This hack helps lessen the amount of paint that can accumulate around the rim and lid. Using our small trim brush and trim guards we painted along the ceiling, baseboards, light switches, electrical sockets.., etc. We also were very careful when painting certain corners as the walls were going to be painted in different colors. Once all the trim painting was done we grabbed our paint roller and proceeded to paint the rest of the wall. We repeated this process for each wall color. Each wall took 2-3 coats of paint to reach the desired finish that we were happy with. Because of the theme of this makeover, which will be revealed at a later date. We chose Behr's Crimson Red and Asphalt Gray as our wall colors. Next step will be cleaning and prepping the floors. Thank you for stopping by and checking out our Garage to Man Cave Makeover Phase One! Which Krazy Deal are you most excited about this month? Be sure to let us know in the comments below! This looks like quite the project!! My husband would love a place like this! The project looks astonishing. I guy my man would like it. 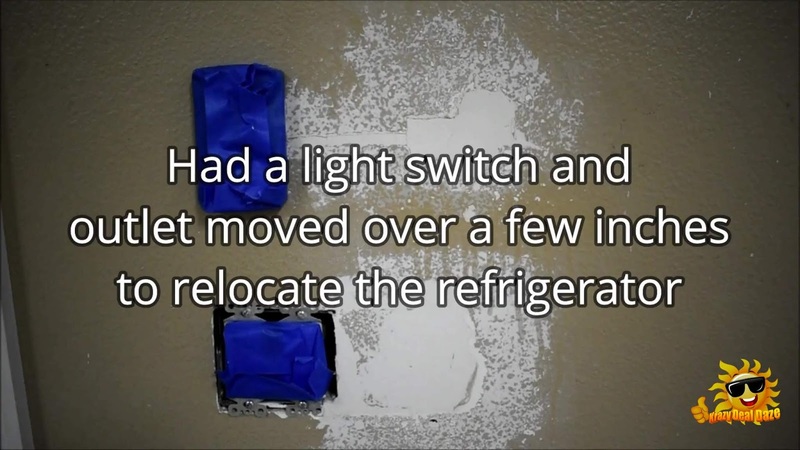 Good thinking on relocating the fridge. 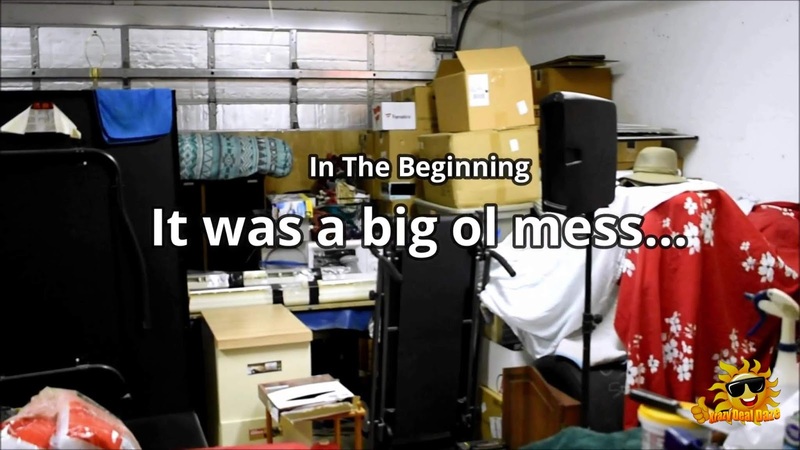 Just an FYI: your "messy" garage looked better than our current situation. Will have to take pointers from you. OMG this must be a huge project but so fulfilling. If you are a handy man then you can love this type of work. This is such a cool project. 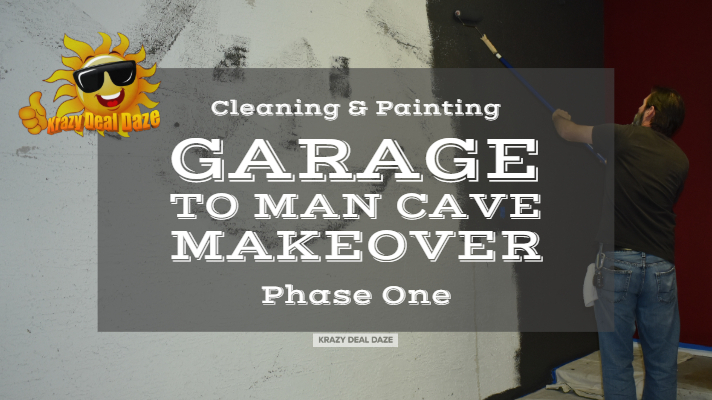 We don't have a garage but it would be great to do the work on remodeling yourself. Awesome project, My husband would love to do this one day. Our problem would be to find a new location for all of our mess hahah. 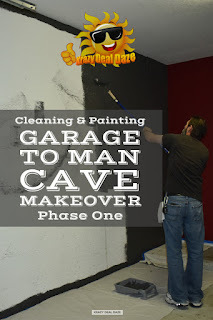 My SO wants a man cave in the garage. However, we have to get rid of the crap that's just sitting in their first as well. I'll have to share this post with him. Wow! What a project! Can't wait to see the finished result. This looks kinda familiar because my husband works as contractor of remodeling houses and stuff. Can't wait to see the finish project!